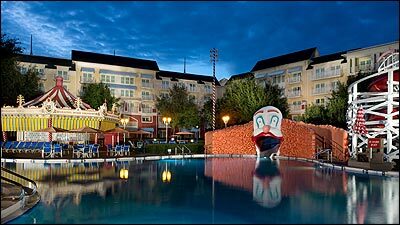 This turn of the century themed resort lies at the edge of Crescent Lake. 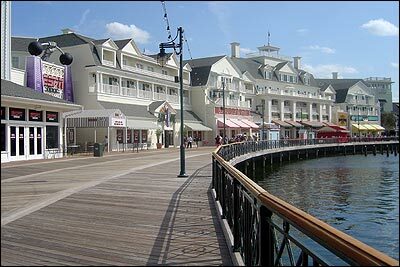 The sprawling complex contains a resort hotel, Disney Vacation Club wing, and numerous shops, restaurants, and entertainment options along the bustling Boardwalk. 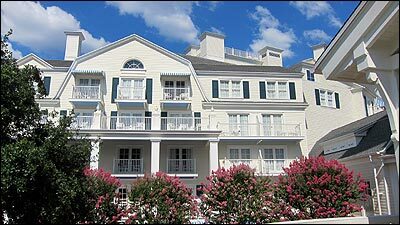 The BoardWalk Inn is the hotel side, featuring 372 deluxe hotel rooms. The hotel features a pool, tennis courts, arcade and more. 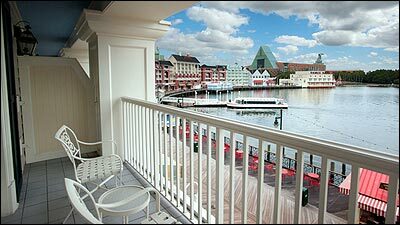 The resort is within an easy walk to both Epcot and Disney Studios, as well as the Yacht and Beach Club, Swan & Dolphin Resorts. Thus, a host of dining options is just outside your door when you stay at this conveniently located resort. At night, the BoardWalk comes alive with twinkling lights and flashing neon. 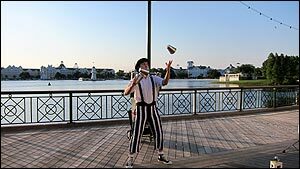 Live entertainers perform nightly and games on the boardwalk keep everyone busy. Renting a surrey bike at the BoardWalk is a highlight of this location. 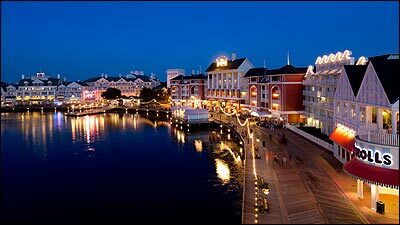 The ride around Crescent Lake is fantastic, particularly at night. 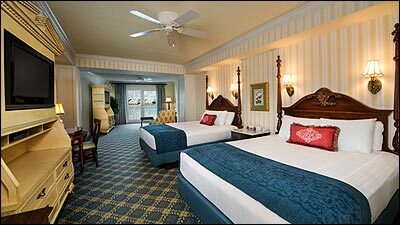 Room rates range from $408-723 per night. 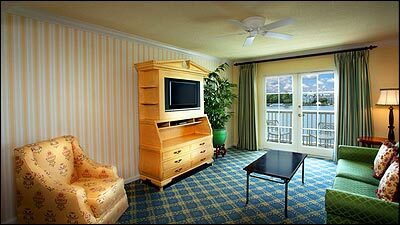 Club Level rooms range from $596-1081 per night. Room rates vary based on season. Rates are higher on weekends and holidays. Number of beds: 2-queen beds (323) OR 1 King bed (55) and 22 disabled-accessible rooms. Features of Room: Free Wi-Fi, dresser, refrigerator, TV, small safe, night stand, desk with pull out table and chiar, armchair, iron, ironing board, hair dryer, makeup mirror, and ceiling fan. Balcony: Yes (most rooms). Ground floor rooms have patios. Extras: Newpapers are available free in the lobby. Nightly turndown service is available to all guests per request. The Honeymoon cottages have a fenced in private yard. They come with a queen size sofa bed, a TV, a 2-piece bathroom, and a bread bar. The bedroom is in a loft and includes a king size bed, a TV, night stand and a full bathroom with a Jacuzzi tub. There is also mini-TV for viewing while in the Jacuzzi. Suites: Yes - A total of 16 suites are available. Club Level: Yes, club level room and suites are available. 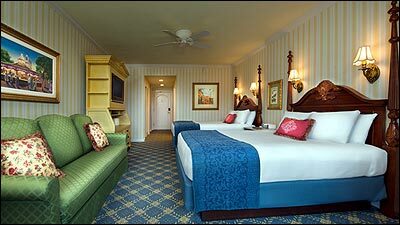 Rooms include: robes,DVD player, make-up mirror, deluxe turndown service, continental breakfast buffet, snacks in the afternoon, and an evening presentation of appetizers, wine, cheese, and cordials. Visit our Club Level page for more details and guest feedback. 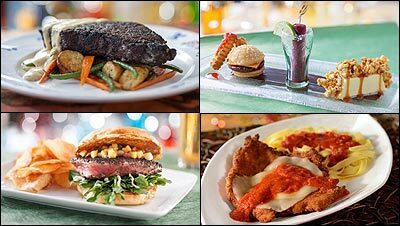 January 31, 2016 is the last day to book a dinner reservation at Flying Fish Cafe on Disney's BoardWalk, as the signature restaurant will close for several months as both Walt Disney Imagineering and the culinary team re-imagine one of the most popular places for dinner at Walt Disney World Resort. You can expect a whole new look, and the team will be working on a new menu. Enjoy fine seafood and steaks in a whimsical, upscale dining room. This is a Disney Signature Dining Experience. Specialties: Seafood, steaks, fresh seasonal items, and unique desserts. Italian oven baked favorites, pastas, pizza, salads, grilled meats. A working brewpub featuring specialty draft beers and home cooked favorites. Specialties: Pub pie, fresh sausages, baby back ribs, tuna, beef tenderloin, meatloaf, gourmet burgers and hot sandwiches. Specialties: Assorted baked goods, sandwiches, salads, specialty coffee. Pizza by the slice or whole pie and beverages are available here. Room Service- available from 6:00AM-12:00AM. A menu can be found in your room. Lounge and dance club for 21 and over only. Hours: Tuesday-Saturday -- 9:00 p.m. to 2:00 a.m.
A Dueling piano bar where you choose the play list. Take part in non-stop live entertainment in a casual atmosphere. Hours: 7:00 p.m. - 2:00 a.m. Swimming: The Luna pool features a 200 foot water slide, Keister Coaster, that is designed as a roller coaster. Elephant sprayers surround the pool area. There are 2 quiet pools. All feature hot tubs. Playground: A playground is located near the Luna Pool. 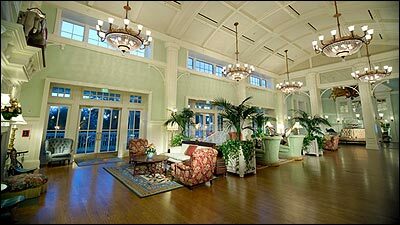 It is quite large, modern, and one of the best at a Disney resort. Games: Side Show Games Arcade. Midway games on the Boardwalk are also available at WildWood Landing. An additional fee is required to play midway games. Fitness: Muscles & Bustles Health Club (open 24 hours and free to resort guests) features a variety of cardio and weight training equipment. A Sauna, Steam Room and Massage Services are also available. Visit our Health Clubs & Spas Page for more details. Access to the fitness center is free to resort guests. Paths for walking and jogging. Specialty Cruises, Fishing excursions and Tennis are also offered. Bikes: Surrey Bikes and regular bikes are available to rent on the Boardwalk and at the community hall. 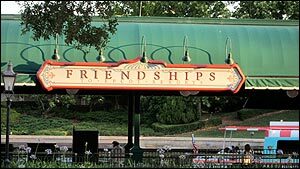 Boats: Friendship launch to MGM & Epcot. 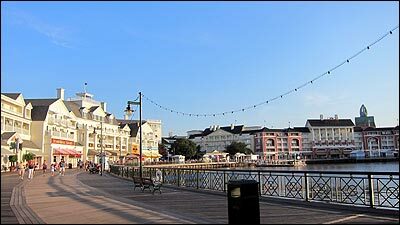 Walk: A short five to ten minute walk to Epcot's International Gateway. 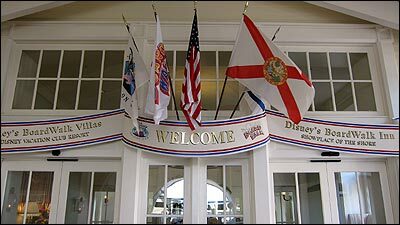 You can also walk to Disney Hollywood Studios, Swan, Dolphin and Disney's Yacht and Beach Clubs. Garden view rooms offer a view of the gardens and walkways. Pool & Water view rooms overlook Crescent Lake and the boardwalk. Standard view rooms offer views of the entrance and parking lot. The Harbor Club closed in March, 2003. For more details visit our page on Childcare facilities. 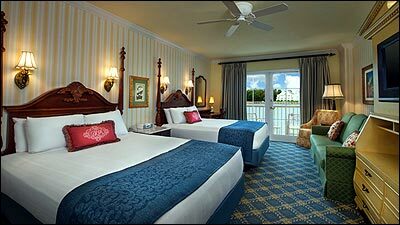 Visit our Disney Vacation Club pages for information on the BoardWalk Villas.